Rembrandt. We know the name, but do we know the work? A new exhibition is at the North Carolina Museum of Art in Raleigh, with a special free preview day today. “Rembrandt in America” highlights both the authentic and inauthentic Rembrandt paintings side by side. Dennis Weller: "Before Rembrandt, portraits in the Dutch Republic tended to show individuals – certainly the features were there – but they were rather stiff and static. You didn’t think that they breathed air and they had blood running through their veins. When you get to Rembrandt you’ll see that he brings those elements into his paintings. He’s able to very wonderfully and effectively capture the personality of the sitter in a way that previous portrait painters just were not able to do." The way he paints the musculature about the eyes, says Dennis Weller. The way he controls the light. The emotion in the face. The soul – somehow -- revealed. It was once thought that Rembrandt produced a total of about 700 works. Today we know that the number of authentic Rembrandts is probably less than half that – about 320. Noelle Ocon: "All the clues could say it’s a Rembrandt, but it doesn’t look like a Rembrandt. Probably isn’t." Noelle Ocon is Conservator of Paintings at the North Carolina Museum of Art. The confusion about Rembrandt comes, in part, because Rembrandt taught his workshop assistants and students to paint in his style. According to Guild rules of the time – if one of his pupils did a painting in his workshop, Rembrandt could sign it. The master had imitators also. And there were scoundrels who passed off their work as Rembrandts. So, how do you tell the difference? Rembrandt or not Rembrandt? X-rays, infrared photography, chemical analysis – they go only so far. Conservator Noelle Ocon. Ocon: "I can’t imagine the technology of something that’ll definitely say somethings a Rembrandt." She says the eye is still the most important instrument. Yet we know the eye is famously fallible. In the 1950s, the North Carolina Museum of Art’s director – reknowned Rembrandt scholar William Valentiner – recommended the acquisition of two Rembrandts for the museum. They were displayed when the museum opened in 1956. Years later, it was discovered that those paintings were not Rembrandts. One is now attributed to Rembrandt’s colleague -- painter Jan Lievens. The other? We don’t know who painted it. Again, Noelle Ocon. Ocon: "It’s a very interesting thing. Maybe you get, you look at things through Rembrandt-colored glasses. You really want it to be something. And, it’s not." Rembrandt or not Rembrandt – it will probably never be completely resolved. And, something else to consider, curator Dennis Weller says -- an idea that’s just beginning to get more traction among Rembrandt scholars. 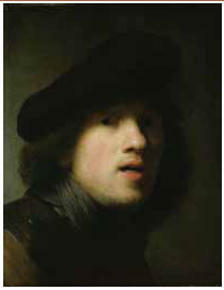 In a given portrait, a well trained assistant may have done the background and clothing, Rembrandt the face and hands. You might say, he subcontracted. Weller: "When you talk about is it Rembrandt or not Rembrandt, perhaps we should re-phrase that and say: Is it Rembrandt and students of Rembrandt in the same painting?" So -- a painting could it be maybe 68 point 5 percent Rembrandt? Weller: (laughs) "Right. If you want to take the size of the picture and divide it up into clothing versus face, and do a percentage. But, again if you’ve got a Rembrandt face you’ve got a Rembrandt. Because that’s really what it’s all about. How he captured the spirit of the sitter." For this museum show, 27 authentic Rembrandts are on display. Plus discredited Rembrandts. And a few that the experts are still not quite sure of. You be the judge. ''Rembrandt in America'' highlights both the authentic and inauthentic Rembrandt paintings side by side. Fred Wasser has this story of the artist and those who copied him. Edvard Munch’s most famous painting is “The Scream.” It depicts a skeletal figure holding his hands against his face in horror. This image has been reproduced and parodied the world over. But Edvard Munch's life and other works are largely unknown to the general public. A new exhibit at the North Carolina Museum of Art offers visitors an unprecedented chance to follow the 40 year career of one of Africa’s most celebrated contemporary artists.